Dr. Tim Riordan serves as pastor of SonRise Baptist Church in Newnan, Georgia and is the author of Songs from the Heart: Meeting with God in the Psalms and his newest book Immovable: Standing Firm in the Last Days. He has been in ministry for over 30 years and received degrees from the University of Georgia, Southwestern Baptist Theological Seminary, and New Orleans Baptist Theological Seminary. He is married and has six children and one grandchild. For more information on his books or ministry, visit his website at www.timriordan.me. Dr. Tim Riordan's Immovable: Standing Firm in the Last Days is a solid resource for anyone looking to prepare themselves for today's troubling times. The world is undergoing a period of tremendous social and cultural change. Tim Riordan's book serves as a fundamental guide on how Christians can fortify their faith and prepare for the last days. Great research leading to solid analysis and writing that actually speaks to the reader make Immovable a must-have for any Christian home. Adherents of Christianity are now living in a challenging time where socio-political forces all over the world are nibbling away at the foundations of their faith. Dr. Riordan's book gives Christians a wake-up call to the troubles besieging their beliefs and an in-depth plan on how to reinforce their faith and prepare themselves for Christ's second coming. He gives us a comprehensive guide on how to use the myriad spiritual tools God has gifted us with in order to remain steadfast and firm in His Grace. Told in an easy to read narrative that balances the interesting and the informative, Dr. Riordan manages to draw the reader into a meaningful theological discussion about the fate of Christianity. The dissection of current geopolitical events, interspersed with scholarly examination of Biblical passages, serves to elucidate the reader and make them aware of the signs and portents that warn about the troubled times ahead. Immovable: Standing Firm in the Last Days is a book that merits discussion in every Christian gathering and is a must-have in every library. If he speaks even half as well as he writes, I for one would love the chance to hear Dr. Riordan in person and listen to the message he so eloquently conveys. Standing firm in the Christian faith can only be accomplished by being properly equipped. As signs of the last days surround us, now, more than ever, it is essential that believers put on the armor of God. Dr. Tim Riordan goes beyond simply discussing what is coming in the last days in Immovable. The book is broken into two parts; in the first part Dr. Riordan discusses what we as Christians can expect concerning the spiritual warfare that will become increasingly more intense, and in the second he provides the practical guidance written about by Paul in Ephesians chapter six. Both parts step beyond the often mystical theology surrounding the last days and look directly at the preparedness that is necessary in order for a Christian to be immovable in their faith. In addition to the discussion of prophecy and equipping oneself to stand firm, the author has provided a guide to becoming a Christian and a study guide for small group application. Immovable is a very practical application of Ephesians chapter six to the lives of Christians that might very well be standing within the last days. Dr. Tim Riordan has very accurately expounded upon the purpose behind the Pauline advice to put on the full armor of God. More than just advice, however, Dr. Riordan has gone into a great deal of depth concerning each piece of the armor, how it is applied and how to keep it fitting firmly in place. This book is not a mystical and symbolic representation of the truths of scripture, but rather a very practical application of it that will challenge the reader to be prepared to stand firm against the numerous forces that will attack Christians in the last days. 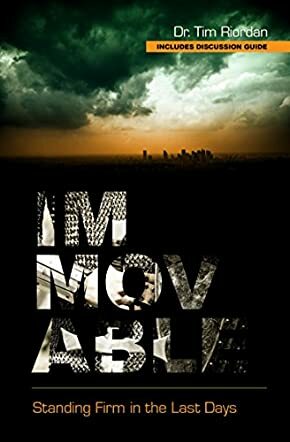 Uplifting, practical and accurate, Immovable is a solid application of the Gospel of Jesus Christ and a must for Christians living in a world that could very well be coming to an end.